Party today, far away ... Sam finds a great deal to sing about as he echoes "the chat" on the way to visit a majestic forest friend in GRAN, GRAN, GRANNY. 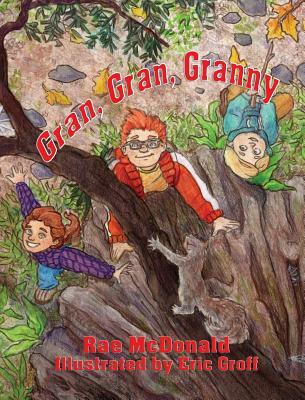 Lizzie tells this moment-in-time story as she, two brothers, and her parents hike up the well-worn trail to visit one grand old Douglas fir tree known as Granny. The forest is aflame with fall color and the path is carpeted with fall leaf confetti on the day following a fierce and worrisome storm. A celebration cake swings along in mom's traveling basket as Lizzie, Nick and Sam lead the way. Lace up your hiking boots, get set to catch a swirling leaf, and head up the path to celebrate a very grand old tree.